So, are employers using these tests just to screen out people with undesirable characteristics? The answer is very definitely not. Whilst personality tests are used to screen out the dishonest and the unstable, employers are also looking for some very specific qualities in their employees. The single most important of these is motivation. In the western world he cost of employing people has risen out of all proportion to other business costs. Technology, equipment, communications and even real estate have all become relatively cheaper, but the cost of employing anyone has increased dramatically. This is why it is worth the expenditure and upheaval to move jobs offshore to countries where labor is cheap. Consequently, the days when organizations could ‘carry’ employees who were giving less than 100% effort are long gone. Employers now expect staff to be totally committed to the organization and to getting the job done. You should agree or strongly agree with questions of this type. You should disagree or strongly disagree with questions of this type. I really look forward to my annual vacation. You need to be seen as the employee who will go the extra mile every time. Determination, persistence and the willingness to do whatever it takes to achieve your goals are the things that employers are looking for. There are some jobs which have become synonymous with extrovert personalities. Sales is one example, it is difficult to imagine a successful sales person who is not naturally extroverted. The qualities associated with this personality trait; friendliness, gregariousness, assertiveness, cheerfulness, and a high activity level are all qualities associated with successful sales people. For employers to look for these qualities when recruiting sales people makes sense and is exactly what you would expect. 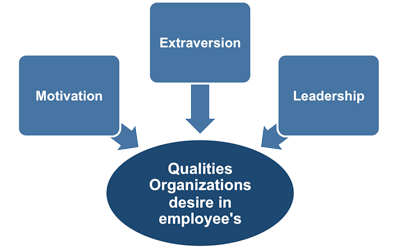 However, for almost all jobs, not just sales, employers prefer extroverts over introverts every time. The reasons for this are twofold; Firstly, even people in highly technical jobs work in teams for much of the time, they need to get on with people and get them to cooperate to get the job done. Secondly, most employers take a long term view of the people they employ. The person employed today to input figures into spreadsheets could be working as a supervisor or manager in a couple of year’s time and it is better if they appear to have some of the attributes that will be needed in the future. Obviously, there is no point in trying to ‘fake’ that you are highly extroverted if you are not. Psychologists believe extroversion/introversion to be the most difficult personality trait to consciously change. However, you most definitely do not want to appear to be too introverted. It's easy for people to see my moods. Leadership qualities in professionals at all levels of management play a key role in business success and there has been a increasing interest in the qualities that make someone a leader rather than just a boss. Many of the graduate and management personality tests try to determine your leadership qualities. Whatever type of job you are applying for, showing some of these qualities is probably a good thing. Once again, there is no point in trying to ‘fake’ that you are natural leader if you are not, but you don't want to give the impression that any sort of leadership is beyond you. Nothing motivates employees more than money or fear of losing their job..